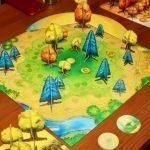 Welcome to the 9th in a series of reviews of 10 of my favorite board games. 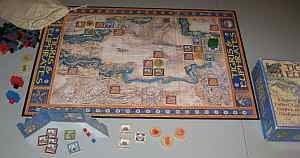 Today I’ll give you some insight into a classic board game by Reiner Knizia called Tigris & Euphrates (T&E). 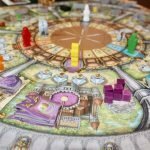 Tigris & Euphrates is generally considered to be a “heavy” game, meaning there are lots of options on any given turn, and it will usually take a fair amount of pondering to try to figure out your best move. And even then there’s little guarantee you’ve really picked the very best one. T&E starts with 10 red temple tiles, each holding a treasure (unpainted wooden cube), in preset locations which are the same every game. Each player starts with 6 tiles drawn randomly from a bag which he then hides behind his cardboard shield. You also get a set of circular wooden tokens showing the same symbol (archer, bull, potter, or lion) in each of 4 colors – red (priest), blue (farmer), green (trader), and black (king). On your turn, you can place leader tokens (next to red temple tiles), place tiles (often to score points but sometimes to start a fight), cause a catastrophe (special tile), or swap tiles from the bag. You score points when a tile you or an opponent plays matches the color of your leader in the same group (kingdom) on the board. A supply of small wooden cubes serves as victory point counters. When you score, you place the cubes behind your screen. You can also score points by collecting treasures, building monuments, and winning battles. 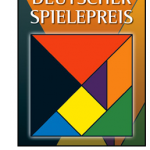 The game ends either when the bag of tiles is so depleted that a player cannot refresh his supply to 6 or when no more than 2 treasures remain on the board. To determine the winner, each player counts the number of cubes collected in his lowest color. For example, if you had 8 reds, 6 blues, 7 greens, and 10 blacks, your final score is 6. Ties are broken by comparing next lowest and so on. As you can see, you need to spread your influence on the board across all 4 colors so as not to fall behind in any one of them and end up with a low score. Collecting 20 each of the reds, blues, and greens but only 1 black is not a good thing. Brainiac college students will probably gravitate to Tigris & Euphrates – not that others won’t love it too. It definitely is more thinky than many of my other favorite games though. It’s also more abstract. The ancient warring kingdoms theme is there, but once you get into the game, all you really care about is the 4 colors. Check the price of Tigris & Euphrates on Amazon. 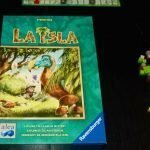 Nice summary of a great game. 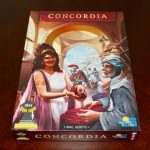 I agree with the synopsis that I never know if I made the right move – but that just makes me like the game more! Thanks, Josh. I wish this one would make it to our table more often. I usually have to reread the rules each time it does.